9.000 Kgs of Wheat per. Ha. Specif. Weihgt:82.; 6.500 Kgs. Of Oat per Ha. ; 11.500 Kgs. Of Barley per Ha. ; 22.000 Kgs. Of Corn per Ha.+1,55mg/Kg of tryptophan;14.500 Kg. Of Rice per Ha. And 2.1mg/Kg. Of Vitamine A+400% of Vitamine E+4% protein. ; 215.000Kgs. Of Tomato per Ha. ; 415 Kgs. 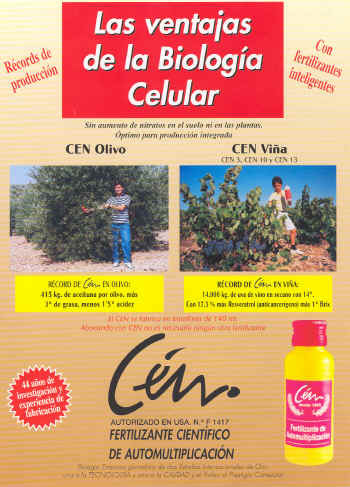 Of Olive per olive tree + 3 grades fats-1,5 acid; 80.000Kgs. Of Marisol per Ha. 80% extra, 19% 1st; 145 Kgs. Of Clementina per tree, 90% 1st A; 14.000 Kgs. Of Wine Grape per Ha. In dry farming with 14 grades: 80.000 Kgs. Of Potato per Ha. 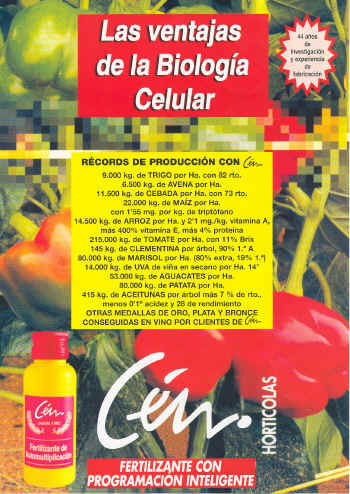 + 46% Vitamin A; 53.000 Kgs. Of Avocado per Ha. Fattening: Conversio up to 1,28, 10% less feed consuption. Meat: 40% more Vitamine A, 30% less mortality, 50% less cholesterol, 70% less fats. Milk: up to 23% more production, 10% less feed consuption, 40% less somatic cells, 45% less cholesterol. Eggs: 15% more production, 20% less feed consuption, 60% less mortality, 90% less cholesterol, 15% more Vitamin A.